ORSUPPORT.COM will beat any price on any pain management RF generator and give you a longer warranty. 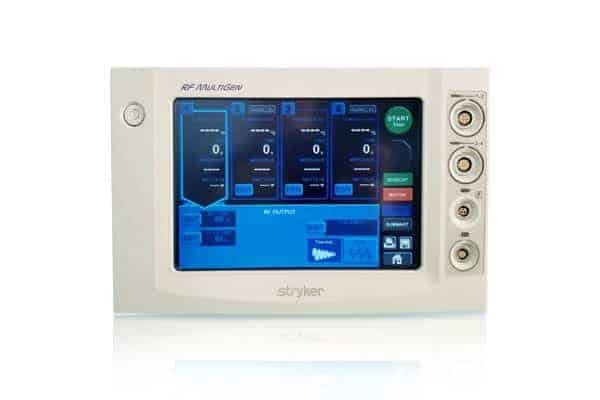 as it is sometimes called, is designed for pain management and can create up to 4 lesions at the same time and with independent control. of the STYLET identifies the gauge of the cannula. Turn on the Multigen generator (press top left button). The unit will perform a self-test automatically. Choose SELECT SAVED PROCEDURE or USE DEFAULT SETTINGS. From the SELECT SAVED PROCEDURE screen, select the correct folder and file to initiate the RF procedure. After selecting the desired file, the RFPROCEDURE SUMMARY SCREEN will appear. Confirm the TIME and TEMPERATURE settings are correct, then press ACCEPT/BEGIN. See IFU for more details. Attach the Stryker RF generator GROUNDING PAD CABLE to the corresponding port on the RF generator. NOTE: Align RED dot to RED dot to connect the cable properly. 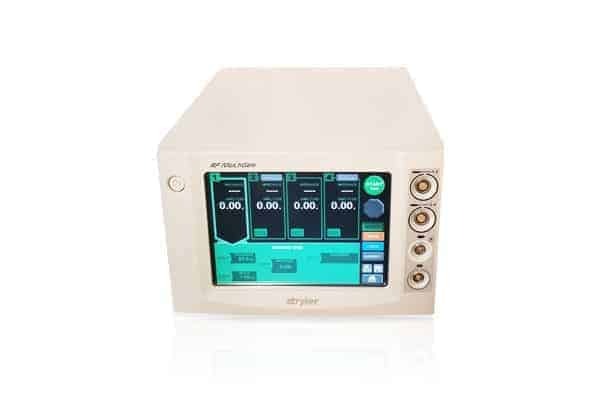 Place the RF GENERATOR GROUNDING PAD on the patient at the physician`s direction. Connect the pad to the GROUND PADCABLE. Attach the CONNECTING CABLE(S) to the corresponding port(s) on the generator. NOTE: Align RED dot to RED dot to connect the cables properly. At the physician`s direction, grasp the sterile end of the appropriate RF ELECTRODE and attach it into the corresponding CONNECTING CABLE. NOTE: If using the ID TAG SYSTEM, attached the numbered RF ELECTRODE to the corresponding numbered port (1-1, 2-2, 3-3, 4-4). See Instructions for use for more details. The pain management physician will now place the RF ELECTRODE into the designated CANNULA. NOTE: The IMPEDANCE value will now be displayed on the Multigen generator. Stryker MultiGen RF Generator ONLY: Select the appropriate RF CANNULA and RF ELECTRODE placement on the screen by touching the corresponding TAB on the RF generator console. See Instructions for use for more details. SENSORY STIMULATION: SENSORY stimulation may be performed to confirm the cannula is properly placed along the painful (target) nerve. 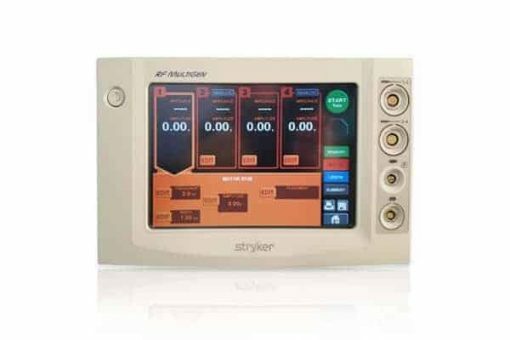 The Sensory Stim screen is Green and the corresponding button located on the far right of the screen is labeled SENSORY. Press START when ready to stimulate. Press the ARROWS on the screen to adjust voltage. Press STOP when testing is complete. MOTOR STIMULATION: MOTOR stimulation may be performed to confirm the cannula is not placed on a motor nerve. This Motor Stim screen is Orange and the corresponding button located on the far right of the screen is labeled MOTOR. Press START when ready to stimulate. Press the ARROWS on the screen to adjust voltage. Press STOP when testing is complete. LESION MODE: When the Pain physician is ready, press the Blue LESION button to access the RF OUTPUTscreen. Verify TEMPERATURE and TIME settings are correct prior to pressing the START button. If required, EDIT the settings of each placement by pressing the EDIT button. To begin RF lesioning press the START button. To guard against any accidental starts, there will be a second pop-up window where you will have to confirm START. Once the TEMPERATURE is within two degrees of the “set temperature”, the TIME will begin to count down. The lesion is complete when the TIME runs out. 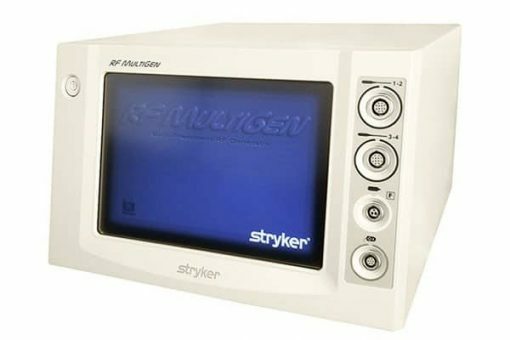 WARNING: Only trained and qualified pain management physicians should use a Stryker Multigen pain management radiofrequency generator. 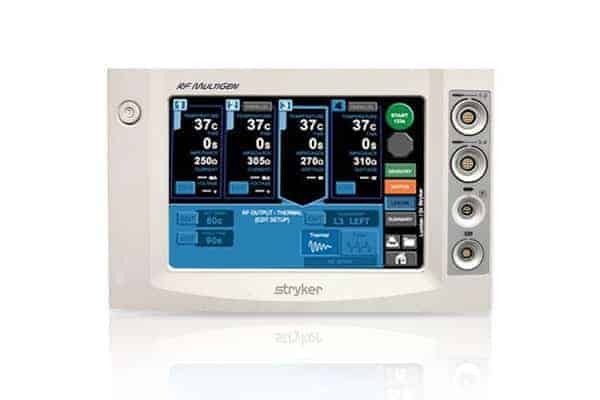 Before using the Stryker RF Generator or any component of the RF generator system, read and understand the instructions for use supplied with the RF equipment. Please call 858-336-1377 if you have any questions. It is hard to go wrong with a market leader, especially if you can find a good used or recertified radiofrequency ablation machine at a great price.